Australiens - PsyTrance in Australia - QueensBirthday Psychedelic Blast! Login to Australiens to add your own event. Enter your own Event into the Australiens system, and after being approved, it will be available online. 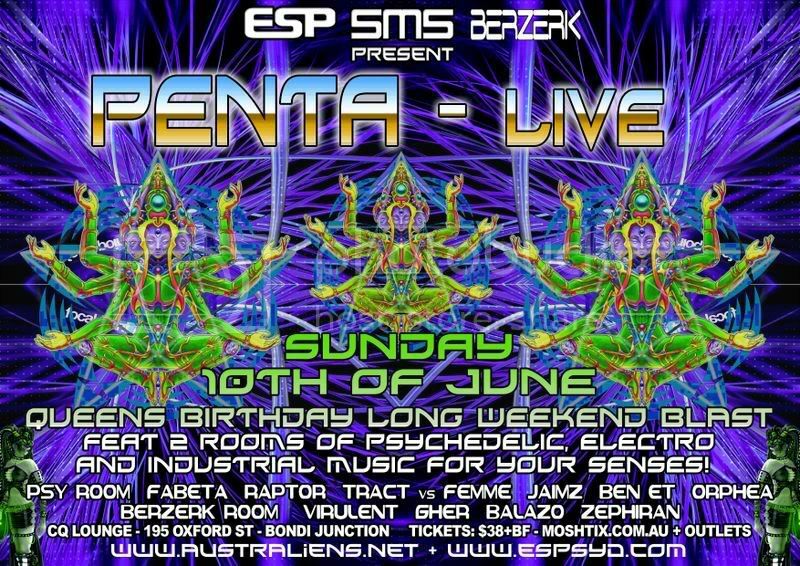 ESP, -sMs- and BERSERK team up to bring you a twin room monster event on Sunday10th June (Queens Birthday Long Weekend) with a very special guest PENTA from SanFrancisco/Portugal performing live for the first time alongside some of Sydney's finest Dj's. Russian born Nikita Tselovalnikov is a veteran of countless punk, rock and industrial projects. With 3 full albums under his belt and multiple V/A compilation releases he has been in continuously high demand at festivals and parties around the globe. With a very clean and pumping psychedelic sound that explodes with energy Penta is renowned for pushing dance floors to the next level. Once again we are very excited to be able to secure him for a Sydney performance in-between his busy global touring schedule. Endless traveling, constant noise of the parties, life in hotels, as well as a considerable dose of couch-surfing, has accumulated in Pentaâ€™s head into something that resembles the chaos of Indian street traffic. Horn Please â€“ the message that is written on the back of the sub-continentâ€™s trucks could never been more appropriate to describe the desire to bring order to trance musicianâ€™s life. This CD, executed in the style of a Mumbai taxi, is a dedication to the crazy party life in the form of a collection of morning and night psytrance tracks, sometimes written in headphones in different parts of the globe, and already successfully tested on the biggest dance floors of the planet. Faster BPMs than in his previous albums, as well as the use of the latest technologies, makes â€œHorn Pleaseâ€ one of Nikitaâ€™s most psychedelic works to date. Berserk, a venture of the Cranial Fracture Recordings label is a Sydney nightclub running on the third Saturday of every month that focuses on electro, industrial and hard psy. The night has established a strong reputation for showcasing quality musicians and dj's throughout it's life with a firm commitment to the music that drives it. The Bezerk Room will feature the sounds you have come to expect from this crew with some added sonic reinforcement and VJ's. As a DJ, Virulent has played extensively in Sydney and Melbourne clubs, including Vortex, Cabaret Nocturne (former weekly residency), Dark Events, Carmilla's, Die Maschine, Batcave, Cyberdelia, Horror and Bloodlust, among others. As a producer/musician, Virulent is known for making the music for "The Crystalline Effect" and "Plague Sequence", among other projects. The Crystalline Effect's debut album "Glass" was released in 2005 by European label Black Flames Records and received great reviews worldwide. Virulent has played dozens of live shows throughout Sydney, Melbourne, Brisbane and Adelaide and is also an active remix-artist, having remixed renowned artists such as Implant, Skoyz, Alien Produkt and Blank, among others. Currently completing a debut album, Plague Sequence is a subjective view of the technofetishistic webwork of a computer-obsessed existence, an intimate portrayal of the integration of the hi-tech into human culture. DJ, Gher is the man behind the 'Opposition' nights at the Livehouse which has featured Episilon amongst others. Playing a mixture of hard Industrial and Dark Psytrance in his sets, Gher more recently played Berserk as the special guest Dj. headCleaner Visuals has been alive for around four years performing at parties in both Sydney and Canberra. As a collective we have a very strong grounding in audio and visual media(we have all had stints as dj's, sound engineers, composers and even violinists) and this has flowed into video and Vjing. BALMAIN: Fish Records Balmain, 289 Darling St.